I’m baaaaack! And with a bang at that! What? Were you getting worried? My apologies for taking another long break from the word of blogging but life has been crazy and busy and I just needed to step away for a bit. But I am back and with a lineup of some great recipes for all my wonderful followers. And I have some very exciting news that I will share in a few weeks if all goes as planned. Still working on fine-tuning so keep your fingers crossed for me would you please? So even though I wasn’t posting recipes over the past couple of months I was still cooking up a storm and making sure to photograph my delicious meals so that when I was ready to get back to posting I was prepared with some great materials. So here we go, let’s get to it! 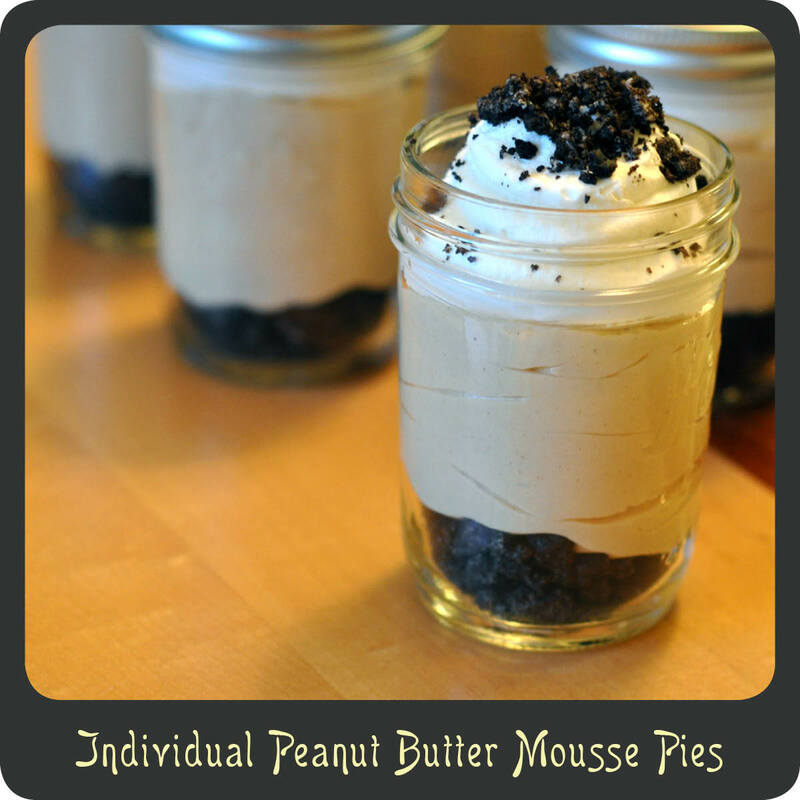 Individual peanut butter mousse pies=a heavenly dessert in super cute little mason jars. As my followers know I LOVE mason jar desserts. And if you didn’t know that then you must be new here. Welcome! Mason jars are perfect because there is no serving involved other than getting out a handful of spoons and they travel great! I made these for a bbq we went to over the summer and they were very well received. Right, Sabrina and Sandy? 😉 The peanut butter is so light and just the perfect amount of sweet. And then you get this yummy crisp chocolate crust to add in a little texture. Nom nom nom! I actually ate one of these a couple of days after I initially made them and it was still great! It didn’t separate or get funky so they will hold up for a few days if you have leftover or even if you want to make them the day before you plan on serving them. Well it is great to be back and thanks for all the continued support! I will be in touch soon! Note: The number of “pies” you get will depend on the size of your jars or serving dishes. I was able to make 12 half pint jars. If you are planning on traveling with them be sure that you don’t fill past the brim so that you can get the lids on them. In a medium sized bowl mix together the crushed Oreos and melted butter. Distribute the crumbs evenly among the jars leaving about a 1/4 cup for garnishing. Using the back of a spoon gently pres the crumbs into the bottom of the jars. Pour the whipping cream into a mixing bowl and add in a 1/2 cup of the confectioner’s sugar and 1 teaspoon of the vanilla. Beat the whipping cream using an electric mixer on high until it begins to thicken and peaks start to form. Put the prepared whipping cream in the fridge for the time being. Place the cream cheese, peanut butter, and remaining cup of confectioner’s sugar in a large mixing bowl and beat on medium speed until well combined. Add in the condensed milk and the remaining tablespoon of vanilla and continue beating until mixture is creamy and smooth. Remove the prepared whip cream from the fridge and add about 1/3 of it to the peanut butter filling and fold in using a rubber spatula. Transfer all of the peanut butter filling to a one-gallon Ziploc bag, seal, and cut off the corner. Pipe the filling into the jars filling up about 2/3 of the way. Next, transfer the whip cream to a one-gallon Ziploc bag, seal, and cut off the corner. Top each mousse cup with some whip cream. 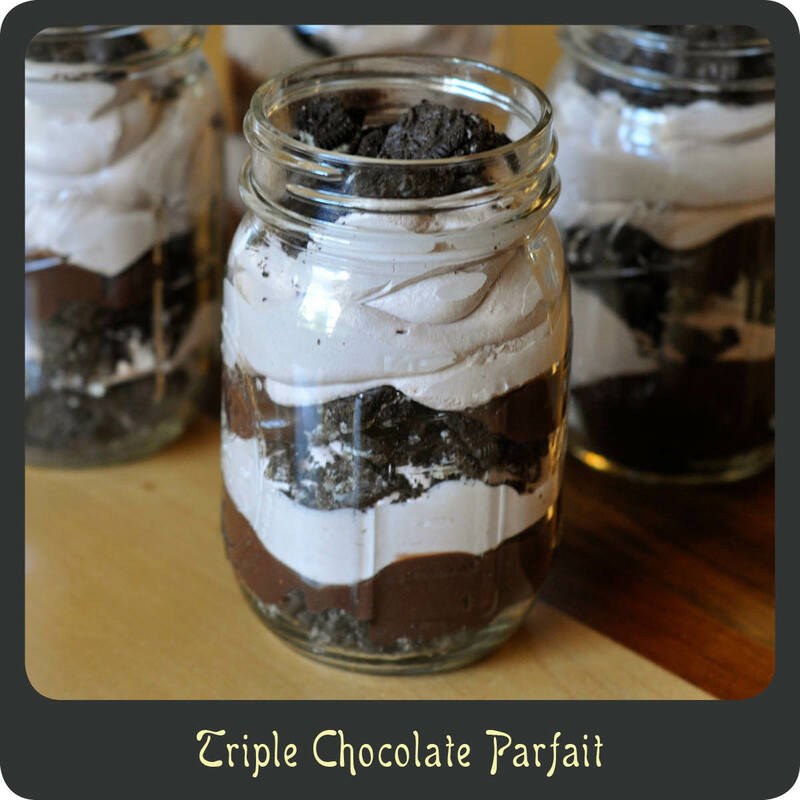 Garnish each jar with leftover oreo crumbs and refrigerate for at least 2 hours before serving.